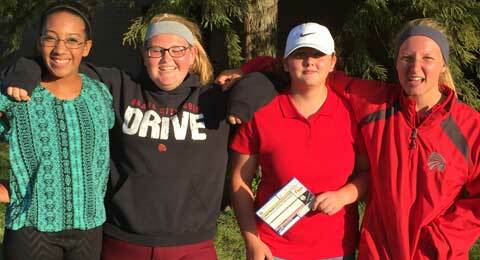 OCHS girls golf team members, from left, Carleigh Gardner, McKenna Hallgren, Taylor Woodward and Brianna Jones, competed at the tournament at Lake Perry Sept. 1. Osage City High School sophomore Taylor Woodward started the Lady Indians’ golf season in the best way possible – with a hole-in-one during the team’s first tournament. According to OCHS Girls Golf Coach Luanne Jacobs, during the team’s Sept. 1, 2016, tournament at Lake Perry Country Club, Woodward hit the hole-in-one on hole number 5. The hole is par 3, with a 125-yard shot. Information thanks to Coach Luanne Jacobs.